Louisville, Ky. – One of Louisville’s favorite treats will soon be in freezers across the country. State and local officials were on hand today alongside company representatives for a ribbon-cutting of The Comfy Cow’s first standalone production facility in Louisville. The Comfy Cow, a local ice cream producer and retailer, is expected to invest $2 million and create up to 40 new jobs over the next 10 years. The facility will allow The Comfy Cow to produce and sell its premium ice cream to retail establishments throughout the United States. Louisville Mayor Greg Fischer says The Comfy Cow’s expansion is a testament to the city’s growing food and beverage sector’s popularity regionally and nationally. The Comfy Cow commissary is a 6,500-square-foot facility in the Regency Pointe Business Center in Jeffersontown. The company remodeled the building and outfitted it with state-of-the-art equipment to increase production capacity and to bring pasteurizing and homogenization onsite. With this investment, the company is able to shift its sourcing of all of its dairy products from Illinois to Kentucky. “This is a major milestone for the company and its growth,” said Don Berg, CEO. Partners Tim and Roy Koons-McGee opened the first Comfy Cow store in Louisville’s Westport Village in December 2009. Since the company’s inception, they set out to create a business that offered both great ice cream and a great ice cream experience by producing a high-quality, super-premium ice cream served in a family friendly, fun and funky atmosphere. The Comfy Cow uses many local ingredients in its products. 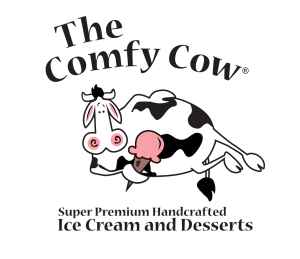 The Comfy Cow has retail locations in Louisville in Westport Village, on Frankfort Avenue, Bardstown Road, at the University of Louisville’s campus and soon in Middletown. The Comfy Cow has recently expanded with franchises in Nashville and southern Indiana. It is also available in many grocery outlets throughout the Louisville metropolitan area, as well as in Lexington, Cincinnati, Columbus and Pittsburgh. To encourage the investment and job growth in Jefferson County, the Kentucky Economic Development Finance Authority preliminarily approved the company for tax incentives up to $350,000 through the Kentucky Business Investment program. The performance-based incentive allows a company to keep a portion of its investment over the term of the agreement through corporate income tax credits and wage assessments by meeting job and investment targets.